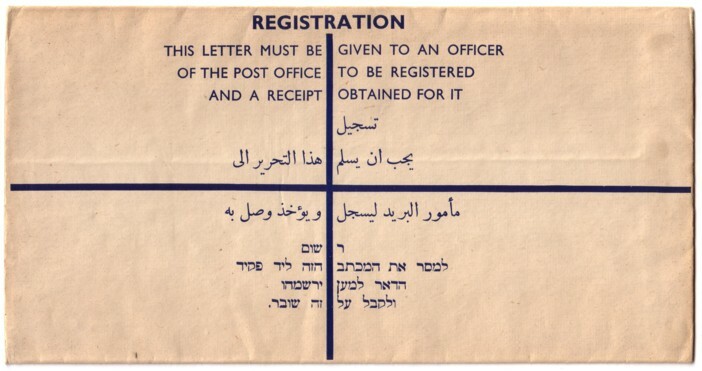 Registration envelope, 1929 (H&G C3). Size: 289x151mm, linen-finish paper. Upright fee stamp (13 Mils) on rectangular flap (gummed). Length of REGISTERED LETTER (in serifed type): 79mm. 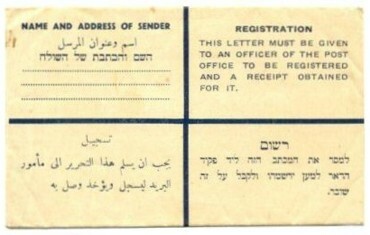 Registration envelope, 1943 (H&G C8b). Size: 289x151mm, linen-finish paper. Sideways fee stamp (15 Mils) on triangular flap (gummed). Length of REGISTERED LETTER: 69mm. 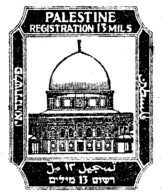 Note the error on the fee stamp: Arabic value is 13. 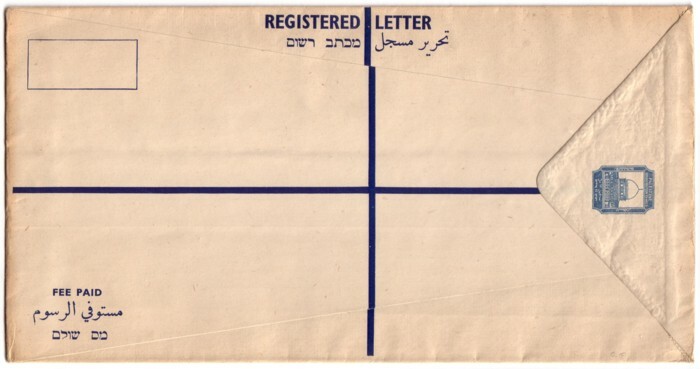 Registration envelope, 1937 (H&G C6b). Size: 292x151mm, linen-finish paper. Sideways fee stamp (13 Mils) on triangular flap (gummed). Length of REGISTERED LETTER: 69mm. 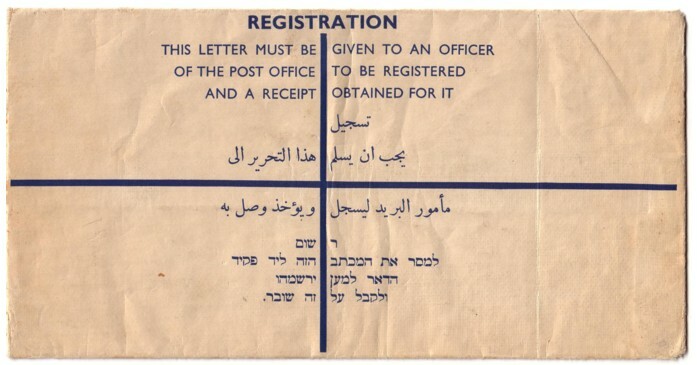 Registration envelope, 1938 (H&G C7). Size: 152x96mm. Sideways fee stamp (13 Mils) on triangular flap (gummed). 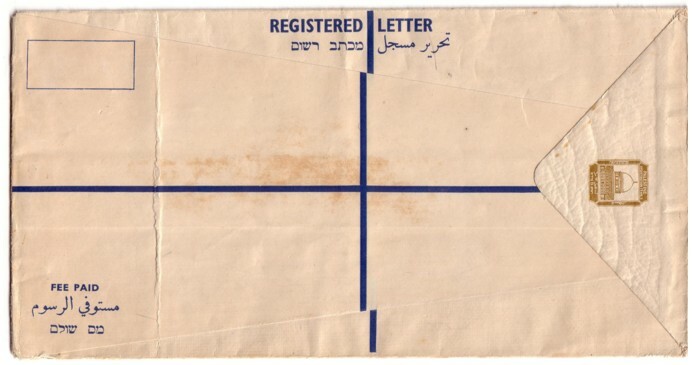 Locally used 1945 registration envelope (H&G C9, Hochh. RE16) uprated with a 10 Mils stamp. Note the corrected Arabic value: 15 Mils. 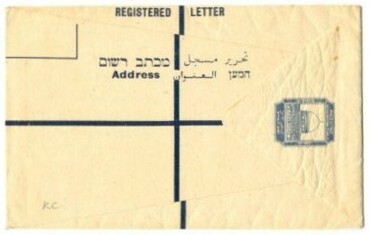 Datestamps HAIFA / HADAR HACARMEL B.O. 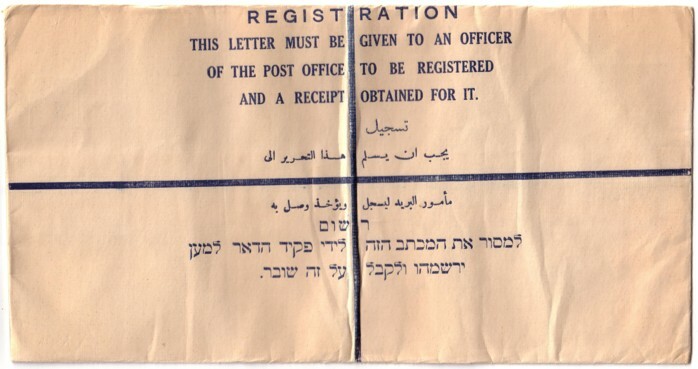 / C / 2 MY / 46 (Sacher J.21) and registration label R / HAIFA 1 / No. 0634 (Sacher R1B). 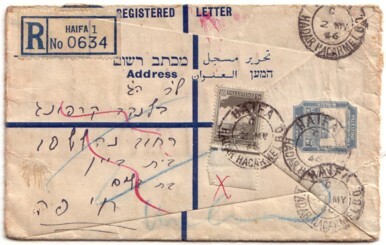 On the reverse side: REGISTERED / HAIFA / 2 MY 46 (not identifiable: Sacher D13/14/17?). 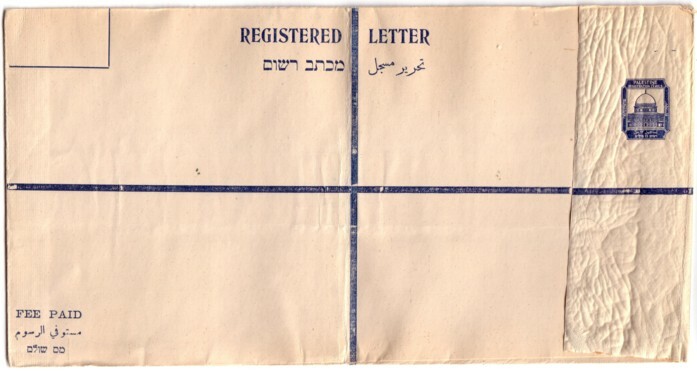 On the front "unclaimed" in blue manuscript, on the reverse three postal handstamps: NOT CLAIMED (Sacher L23), the same in Hebrew and Arabic (Sacher L16), and RETURN TO → (Sacher L10). 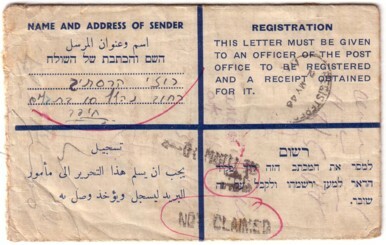 Registered letter used in 1944 from Nes Tsiyona to Tel Aviv: envelope from 1941 (H&G C8, Hochh. 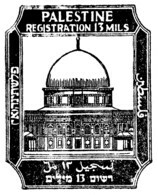 RE13) uprated by 13 Mils stamp cut-out from an earlier registered envelope (H&G C5 or C6, Hochh. RE8 to RE11. 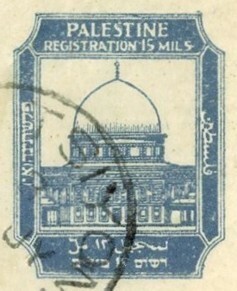 Note the error in the Arabic value of the original stamp: ١٣ (13 instead of 15) Mils. Postmarks: NES TSIYONA / B / 14 JY / 44, registration label R / NES TSIYONA / No 0046. 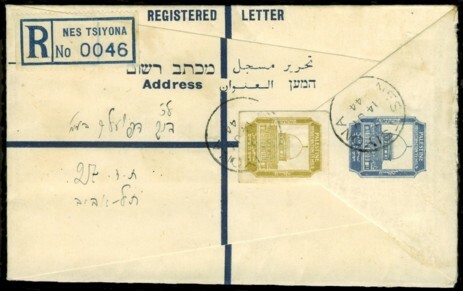 On reverse: REGISTERED / TEL AVIV / 14 JY 44. Image courtesy of: Rolf Wernecke.